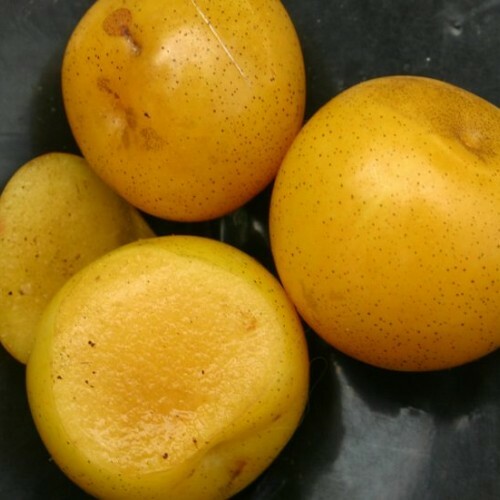 Ussuri plum is a yellow plum from northern China that is by far the sweetest plum at our farm. It rarely has insect damage and fruits very heavy almost every year despite the frost pocket we have them located in. The reason for this is its rather short blossoming period where all the flowers quickly open at once. It flowers about 2-4 weeks before the beach plums and is heavily influenced by warm weather as they come out of dormancy. Our selections come out true yellow. Fruit size varies from 1- 1/2 inches in diameter. From seed, trees begin fruiting in 4-6 years. Its nemesis, the black knot, is impossible to control so now we use only trees that are very resistant to this devastating disease. It appears some black knot does not kill the tree but may weaken it over time, while the tree continues to fruit heavy for many years even with small infections of it in the tree. -30 F or more. Said to be very tough maybe into zone 2 should you dare. Self fertile likely. Plant two for good fruit set. May need a bit of neem to protect against curculio and other fruit worms. Otherwise not too bad in disease or insect resistant but not entirely immune like beach plums.